You might be looking to replace the tires on your vehicle to get it ready for a new season. It is important that you know which types of winter tires are available to you and the way that each type will work on your vehicle. 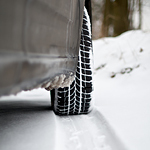 You might choose to add studdable winter tires to your vehicle. These tires give you the option to add metal studs to them to help them have maximum traction when you are traveling in difficult conditions. These can help you get up hills that are covered with snow and they can keep your vehicle on the road. You might choose to go with studless tires for your vehicle. These can give you the feel of studded tires but they are made without the help of metal studs. These tires can give you traction and control every time that you drive your vehicle with them in place.